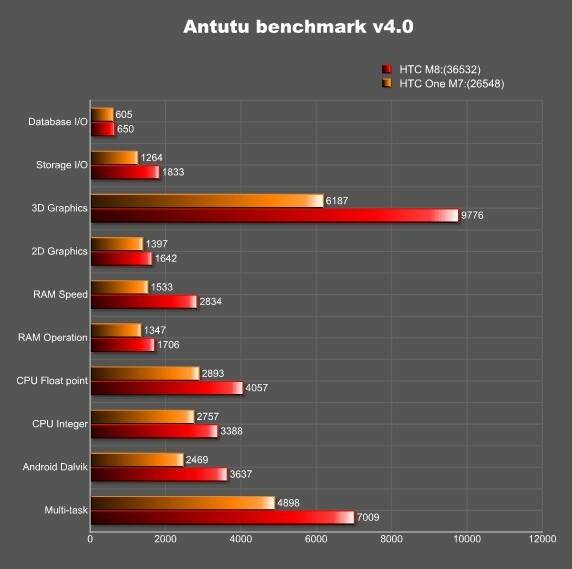 HTC is apparently taking to benchmark apps to see how well its new flagship device is panning out. In newly posted benchmarks from AnTuTu, the M8 device, rumored to be the successor of the One, is seen running a Snapdragon 800 chipset with 2GB of RAM, featuring a 5″ 1080p display. While a few folks have posted that these are finalized specifications, keep in mind that prototype devices featuring non-finalized specs could be tested throughout any given period. For now, we can safely say that these are “possibly finalized” specs, just not completely confirmed. As we can see in the graphic below, the M8 packs a bigger punch than the One, which features a Snapdragon 600 processor and 2GB of RAM. The M8 is also listed as featuring Android 4.4, which should allow the S800 to perform certain tasks with more ease than a device running Android 4.3, given the work Google put into the OS to utilize less RAM on a device. Overall, the M8 should be a great step forward for HTC in the spec department, but we feel that many will have their eyes more on the externals than the internals. From the various leaked images we have seen, the new flagship should hold the same look of the One, but possibly a more rounded metallic feel. We still have a ways to go before HTC announces the device, so you can bet on there being plenty more M8 leaks in the future.